We know Soledad Miranda the actress. 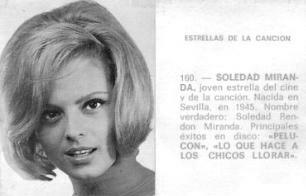 But Soledad also had a brief pop music career in the early 1960s. (This fact was so little-known until recent years that Jess Franco was not even aware of it! When I told him about it, he said: "I never knew Soledad made any record, she never tell me about it.") Talent in singing and dancing led to Soledad's first movie roles, and her beautiful singing was highlighted in several films during her career. 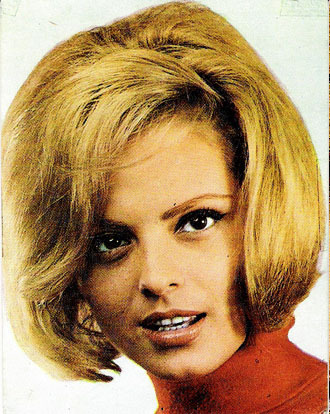 Soledad was popular in the cinema world, and, like many cinema stars, she recorded a couple of records (released in 1964 and 1965). This type of teen pop music is known as yé-yé. When asked her highest aspiration (in a magazine interview in 1965), she said it was to be hired in Hollywood or to become a singer as famous as The Beatles. Well, her records didn't make her a star, but they are a wonderful contrast to her acting roles. Most of us know Soledad as the dark, mysterious icon of Franco's movies. But when Soledad sings, we experience a whole other side of her: flirty, bubbly, happy, and cute, as well as seductive. She has a beautiful voice. She even covered a Mary Poppins tune! 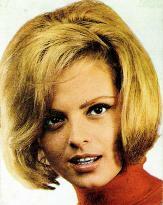 Surprisingly, forty years after her death, Soledad started to be known for her music apart from her acting. Her songs have been featured on various compilations and one of her songs was even played on a radio station in California. Soledad recorded two four-song EP records for the now-defunct Belter label in Spain. The covers, details, and track listings for each EP are below. Click on each title for a song clip in MP3 format. Additionally, I made music videos for two of Soledad's pop songs using footage of her dancing in her movies. Click here for "No lo quiero" and click here for "El color del amor". Also below you can find information on ordering a CD or MP3s of Soledad's songs. Here is a mini "Estrellas de la Canción" collector card of Soledad the singer that was issued in Spain, likely the same year as her first album, 1964. The second picture shows the front and back. Notice that they changed her birthdate so fans would think she was two years younger (19 instead of 21) and also misspelled one of her songs (it's little girls, not little boys)! The third picture shows Soledad's second album promoted on the back of another artist's record. 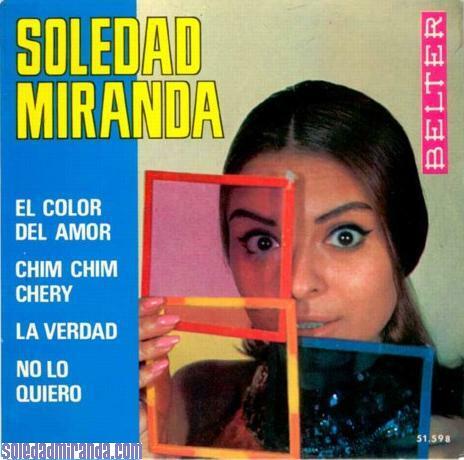 Soledad's records have been out of print since the 1960s, but you can get a copy of this music now from SoledadMiranda.com. 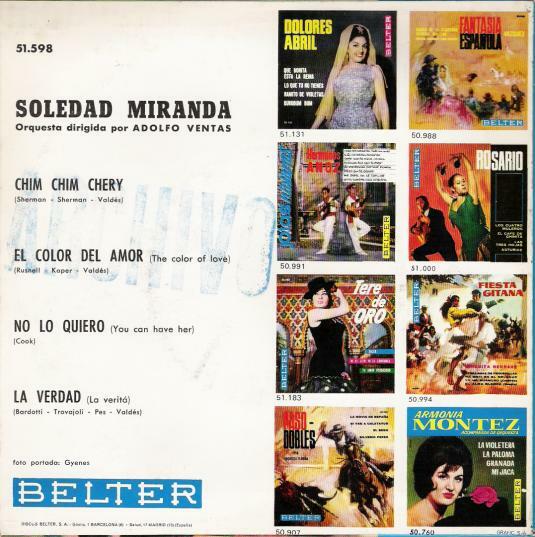 This album, Soledad Sings!, includes the eight songs from Soledad's yé-yé records, as well as eleven charming songs she sang in the movies Canción de cuna, Eva 63, Currito de la Cruz, and Lola la piconera. Though they are not available on any soundtrack, I extracted the audio from the movies and include it on this album, which has a few bonus tracks as well. Most of Soledad's popular movies are dubbed, so many fans have never heard her real voice and wonder what it sounds like. 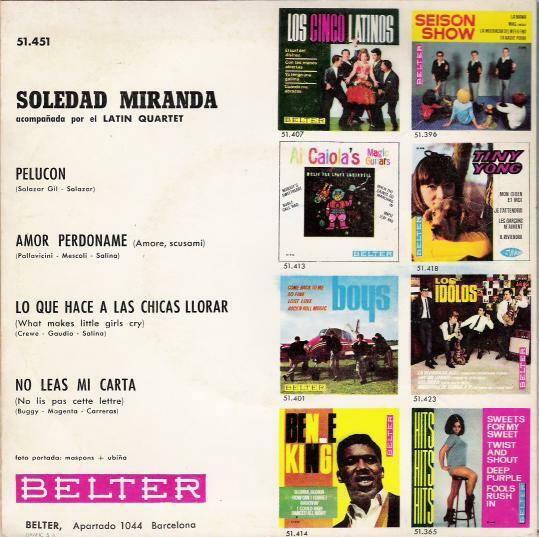 On this album I include a track of Soledad speaking Spanish (from Soltera y madre en la vida), a precious track of Soledad speaking English (from 100 Rifles), and, to answer the question of how to pronounce her name, a track of Soledad's name being spoken (from Eva 63, in which she plays a character called Soledad). An extra bonus are four songs inspired by Soledad: "Soledad Miranda" by American Boyfriends, "Soledad" and "Miranda" by Papillon, and "Recordando te Soledad" by Jess Franco (see the tributes page for more information). There are three options for ordering the album. For a high-quality digital MP3 download including all artwork and liner notes, the cost is $10. For deluxe packaging with a 12-page full-color booklet about Soledad's singing career, the total is $16 plus shipping. For just the CD, the total is $12 plus shipping. Use the buttons below to place your order by credit card or PayPal. If you prefer to pay by money order, contact me. If you're a fan of Soledad you will love her songs and to be able to hear her real voice. Viva Soledad! 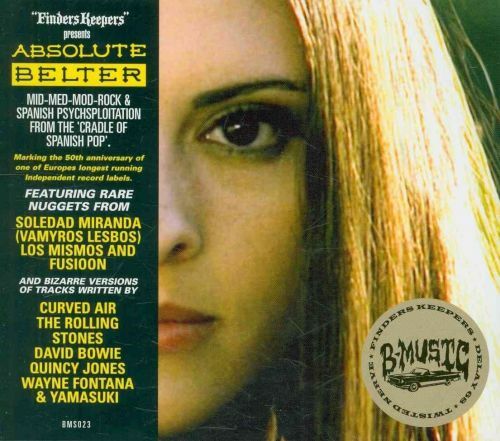 In early 2010 a small record label in the UK, Finders Keepers, released one of Soledad's tracks, "La Verdad", on a compilation album from their B-Music label called Absolute Belter. Not only that, but they used a picture of her (from She Killed in Ecstasy) on the cover! 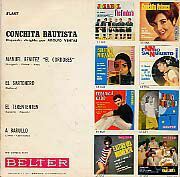 This makes Soledad's first-ever musical appearance on a commercially available CD. Mid-Med-mod-rock and Spanish psychsploitation from the 'Cradle Of Spanish Pop'. Marking the 50th anniversary of one of Europe's longest running Independent record labels. Featuring rare nuggets and from Soledad Miranda (Vampyros Lesbos), Los Mismos and Fusioon. Plus bizarre versions of tracks written by The Rolling Stones and David Bowie. For more information on the disc, click here. Click here to order this CD or vinyl from Amazon. I highly recommend it, as it's a great collection of music that also helps put Soledad's music career in context with her fellow artists of the 1960s pop scene in Spain. A sub-label of Finders Keepers, Bird, released another of Soledad's Belter pop songs on a 10" record called Bird Songs: Effeminate Euphony, a limited edition record store day release. The chosen song this time was "El Color del Amor." 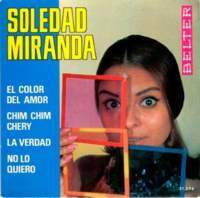 Incidentally, of the eight pop songs Soledad recorded, "La Verdad" and "El Color del Amor" are my two favorites! 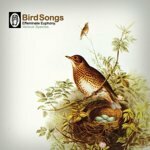 Taking self sufficient songbirds and melodic magpies under our frangible wing Bird Records aims to nurture effeminate euphony of every species, vintage or temperament. For more information on Bird Songs, click here. The limited-edition record is now back in stock at the manufacturer, and also can be found for sale at various online record shops including Amazon . Now I know from blog posts and reviews that people have bought these albums not knowing anything about Soledad, but were pleased with what they heard! That means Soledad is reaching a whole new audience that might not know anything about Jess Franco movies. And also that she is reaching people through her music, which was one of her greatest passions in life. In June 2010 "La Verdad" was played during the show "Melting Pot" on KPFK 90.7 FM in Los Angeles and Santa Barbara, California. I have no idea how the DJ came to play the song, but he probably had a copy of Absolute Belter. Soledad was played in a program featuring artists like M.I.A., Tricky, David Bowie, Flying Lotus, and many others. The best news of all came from my contact at Finders Keepers Records. They were working on a release of Soledad's eight Belter songs, officially, on CD! The CD project has been years in the works and remains unreleased, however her 8 yé-yé tracks were released digitally.